Are you looking for beauty gifts for someone special on your holiday list? Sephora makes it easy for you to find the perfect gift for that special someone. Sephora is one of my favorite stores, and Sephora knows beauty and how personal it is to each individual. They have different price point beauty deals that will allow you to find a the perfect gift without breaking the bank. Gifts like stocking stuffer minis, full size products and organized kits. Check out all of these great deals online and at your local Sephora store! Here are a few of the popular products available at Sephora! This is the gift that keeps on giving for 24 days! It is designed to be given before the 1st of December so that the recipient can open 1 door each day leading up to Christmas. This is a fun gift that is filled with useful beauty products. Want to know what's inside? I won't tell. Advent beauty calendars sell out fast, so if you see one you are interested in, grab it while you can. If this set isn't listed on the site, it probably sold out. Visit Sephora's Advent Calendar section to see which other great beauty advent calendars are available! This is great for any guy on your list. It allows him to try different scents and explore new ones. When he finds one he likes, he can take the enclosed certificate to Sephora and pick out a full size bottle! The travel case is perfect for travel. I love fragrance and love to change it up depending on my mood and time of day. I also love trying new scents. This set is perfect for someone like me. 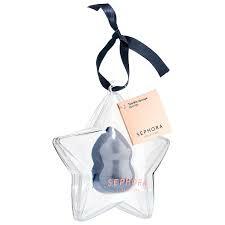 It allows me to try new scents and when I find one I love, I can take my certificate to Sephora and trade it in for a full size bottle. A set that features six shades of bestselling Cream Lip Stain. I love lip products. This one makes a great stocking stuffers and has so many great colors that look good on any skin tone. Sephora Collection's bestselling, high-coverage lip color glides on smooth and transforms from a creamy texture into a silky, lightweight stain. Infused with avocado oil, the long-lasting formula delivers rich color that feels comfortable, is never sticky, and won’t dry out lips. The precise applicator hugs lips for the ultimate precision and the lightweight, long-wearing matte formula keeps color comfortably in place. A must-have for any holiday soirée. Add a little Holiday sparkle to your everyday makeup routine. Silver glitter is sprinkled right in this soft and bouncy expert blending sponge for an elevating makeup application experience. The dual-ended sponge features a wide base to cover larger surfaces of the face, while the pointed tip is ideal for contouring around facial curvatures, and for precision application around the nose, chin, and under the eyes. This shape is easy to grip and use—hold from the base for a softer application, of grip from the curved waist for a heavier application. It makes the perfect gift comes in a star Holiday ornament. 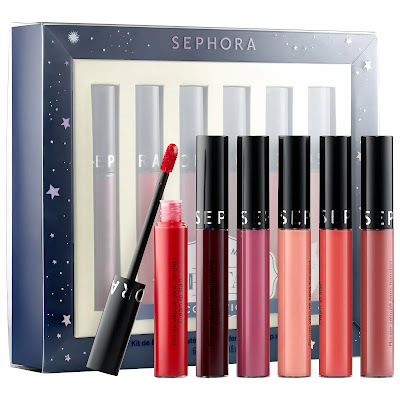 Visit Sephora's Gift Guide to see all of the perfect beauty gifts that you can purchase! The Guide is conveniently broken down by price, recipient, category, top rated, editor's picks, luxury gifts, exclusives, and more. Check out my video showing these great items! Disclosure: I received products to review. All opinions expressed are my own. Love Sephora they have so many great products. If I was not already done shopping I would be getting the Perfume Sampler for my nieces.